National origin discrimination in the workplace means treating a job applicant or employee unfavorably because of the country, world region, or place where that person or his or her ancestors come from. It can also mean targeting someone because of their accent. Treating someone unfavorably because they are married to or associate with persons of a particular national origin group can also be national origin discrimination. National origin discrimination is a serious offense. Federal, New York state, and New York City laws protect employees from national origin discrimination, including workplace harassment because of an employee’s national origin. If you experience discrimination at work, a New York discrimination lawyer can help. It is illegal for an employer to make employment decisions based on your national origin. Employers cannot make employment decisions based on your national origin, citizenship status or accent instead of your skills or how well you do your job. This includes decisions about hiring, firing, discipline, distribution of benefits, promotion, compensation, job training, or any other condition of employment. In most instances, it is also illegal for employers not to offer to employment because the job applicant is not a U.S. citizen, as long as the applicant is legally authorized to work in the United States. New Yorkers are protected from national origin discrimination by employers under Title VII of the Civil Rights Act of 1964, the Immigration Reform and Control Act of 1986 (IRCA), the New York State Human Rights Law (NYSHRL), and the New York City Human Rights Law (CHRL). If you believe that you have been the victim of illegal discrimination, you are protected under federal, state, and New York City laws. Making employment decisions, including hiring and firing, based on national origin or stereotypes about certain national origin groups violates the law. This also includes unfavorable employment decisions because someone is married to or associated with a person of a certain ancestry. A contractor tells Mexicans legally authorized to work in the US that he only hires workers born in the U.S, but then hires workers from European countries. An employer refuses to hire a U.S. citizen born in Nigeria who is fluent in English because she does not like his accent. Laws against national origin discrimination also protect employees from not receiving promotions because of birth place, ancestry or stereotypes about national origin. You are a U.S. citizen of Middle Eastern descent. You have worked in the back offices at an airline for two years and have applied to move up to a front desk position. You have excellent qualifications, but you are not offered the job because the airline is concerned your national origin would make passengers uncomfortable. You have worked in your company’s IT Department for several years, receiving exemplary reviews and an employee-of-the-year award, yet every time you apply for a promotion, you are told you have to first get rid of your accent. The law protects you from differences in any form of compensation, including salary, overtime pay, bonuses, stock options, profit sharing, life insurance, and vacation or holiday pay that are based on your national origin or citizenship status. You were born in Croatia but are working legally in the US. You are promoted to the position of regional manager. An American born regional manager with similar training and work experience was recently hired, and you learn that he will be paid more than you. You were born in America to Venezuelan parents. English is your first language. You are a top salesperson for your company, but your employer reassigns you to a less desirable territory because it is a neighborhood where Spanish is spoken, and your employer thinks it will be a better fit. Meanwhile, a white employee with lower sales is given your territory and client base, enabling him or her to make much more in commissions than you. Employers cannot treat you unfavorably because of personal characteristics or stereotypes associated with national origin. The law prohibits employment decisions based on stereotypes and assumptions about the abilities and traits of individuals from certain regions in the world. Employers cannot treat you unfavorably because of personal characteristics associated with a particular ancestry, including hair texture, skin color, or facial features. Protected practices or characteristics can also include cultural dress, manner, or speech, as long as the practice or characteristic does not materially interfere with the ability to perform job duties. Employers cannot excuse discriminatory employment decisions with business concerns such as the effect on employee relations or the negative reaction of clients or customers. If your employer physically isolates a particular group of employees away from other employees or customers based on national origin, that conduct could constitute discrimination. It is illegal to exclude people from certain positions, or to categorize employees or jobs so that certain jobs are generally held by people of particular ancestry. Unintentional discrimination can also be illegal. Job policies that appear neutral can be discriminatory if they disproportionately harm workers from certain national origin groups, if the policy is not job related. An employer creates an English-only rule that applies even when employees are on break. Such a rule is legal only if it is necessary for the function of the business. An employer institutes a policy where employees are to be searched before entering the work place, but only those of Middle Eastern ancestry are subjected to the search, because the supervisor suspects all Muslims of being terrorists. You do not have to be a member of a protected group to be the victim of national origin discrimination. It is against the law to discriminate against someone because he or she is associated with someone of a particular national origin group. Your marriage to, or association with, persons of a national origin group. Your membership in, or association with, ethnic-based organizations or groups. Your attendance or participation in schools, places of worship, or other cultural practices generally associated with certain national origin groups. 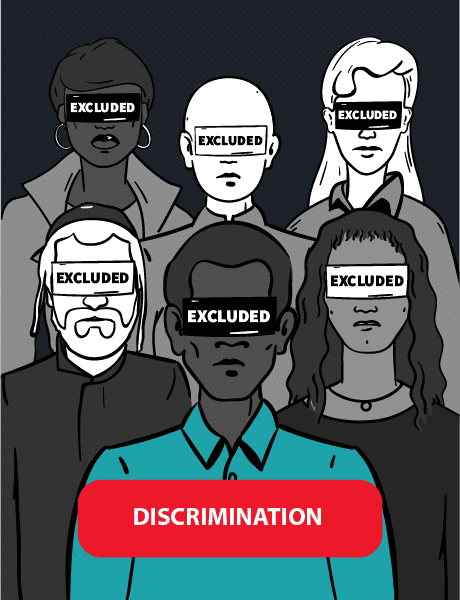 National Origin discrimination can occur when the victim and the person who inflicted the discrimination are from the same background. National origin can never be a bona fide occupational qualification. You can be the victim of national origin discrimination even when no employment decision is involved if national origin-based harassment has created a hostile work environment. Words, such as jokes or offensive or derogatory remarks about someone’s national origin, ancestry or accent. The display of derogatory images, cartoons or drawings. Your employer may be responsible regardless of whether the offensive images are posted in a public area, displayed in a person’s office, or distributed via email. New York City has a lower standard for hostile conduct than federal or state law. Only conduct that is unwelcome or severe meets the threshold for a hostile workplace according to federal and state law. Under federal and state law, if comments or acts are not offensive in the extreme, they constitute harassment only if they occur often enough to create an intimidating, hostile, or offensive work environment. However, a single incident such as a physical assault, or threats of physical assault, might be so threatening and insulting that it could rise to the level of harassment. It is a misconception that only the target of hostile comments can be the victim of a hostile work environment. You can be a victim even if you are not the person being targeted by the offensive behavior – and even if you are not a member of the targeted national origin group. It is a misconception that only your boss can create a hostile work environment. Employers have a responsibility to prevent national origin discrimination. A co-worker, a supervisor in another area of the company, or even a non-employee, like a vendor, can be the perpetrator of discrimination. Discrimination can happen in any workplace. If you think you are the victim of discrimination or a hostile work environment, there are several steps you can take right away. A New York discrimination lawyer can help protect your rights. If you complain about national origin discrimination, it is illegal for your employer to take any action against you. As long as you had a good faith and reasonable belief that discrimination or harassment occurred, your employer is barred from taking any action against you for speaking out or participating in any investigation or proceeding. It does not matter if an agency or court determines that there was no discrimination. If you choose to file a claim for national origin discrimination, you have several options. You can file a complaint with the U.S. Equal Employment Opportunity Commission (EEOC), which handles violations of federal law. The New York State Division of Human Rights handles NYSHRL violations, and the New York City Commission on Human Rights is responsible for CHRL violations. If your claim falls under multiple laws – which it usually will – the three agencies have what is called a “work-sharing agreement,” which means they cooperate with each other to process your claims. There is no need to file a claim with each agency. You simply need to indicate that you want your claim “cross-filed” with the other agencies. Learn how to file a discrimination claim, how to file an EEOC complaint, or contact a New York discrimination lawyer for help. Applies to companies with more than 15 employees, including employment agencies, unions, and federal, state, and local governments, but not independent contractors or domestic workers. Applies to companies with more than 4 employees, including state and local governments and domestic workers. Applies to companies with more than 4 employees, including municipal employers and unpaid interns, as well as independent contractors under certain conditions. Must first file a complaint with the U.S. Equal Employment Opportunity Commission within 180 days of the incident. During a national origin discrimination trial, the court can order damages, back pay, and fines for the victim of discrimination. A New York discrimination attorney can help file a claim to recover money. Back Pay: Victims of national origin discrimination can recover back pay – the money they would have earned without the discrimination. This can include wages, bonuses, benefits, and more. Reinstatement: Courts can order employees to rehire employees who were wrongfully terminated because of discrimination or grant a promotion to an employee who was wrongfully denied one. Front Pay: Front pay helps victims of discrimination return to their prior financial level. It compensates for lost wages and benefits caused by national origin discrimination. Compensatory Damages: Compensatory damages cover any out-of-pocket expenses caused by the discrimination, such as lost wages, therapy, or costs related to finding a new job. It also includes emotional pain and suffering. Punitive Damages: Unlike compensatory damages, punitive damages punish the employer for their role in national origin discrimination. Under New York City law, courts can order punitive damages if an employer shows negligence, recklessness, or a conscious disregard of your rights. Attorneys’ Fees and Costs: Courts can order your employer to pay all your legal fees, including the cost of an attorney, witness fees, and court costs.